Cannabis contains numerous cannabinoids that interact with your body's natural endocannabinoid system. Some of them, such as THC, induce euphoric effects in your brain and body. But cannabis isn't the only thing that brings about the "high" sensation with which we're so familiar. In fact, everything from exercise to guilty-pleasure foods can deliver chemically similar sensations. We already know that truffles contain a "bliss molecule" similar to THC, but here are five other things that can mimic your favorite bud to varying degrees. The "runner's high" is an actual thing, and until recently it was commonly associated with the release of endorphins, hormones that essentially function as "pleasant painkillers." 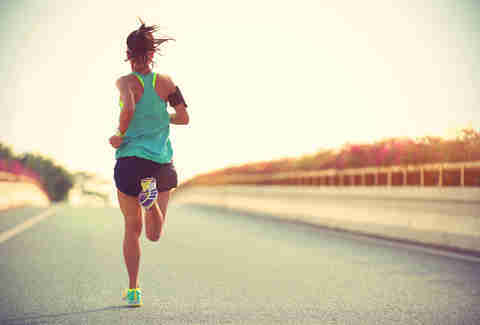 But scientists from the Central Institute of Mental Health at the University of Heidelberg medical school in Germany have linked the runner's high to the endocannabinoid system. Researchers had some lab mice run on a wheel (hopefully outfitting them in tiny adorable running shoes and shorts) and noticed elevated levels of both endorphins and endocannabinoids after their run. The mice acted less anxious and were better able to tolerate pain. Blocking endorphin receptors didn't change their behavior, and the mice still experienced the runner's high. "We evolved to hunt fast moving animals and to escape from equally fast predators. Such prolonged runs are tiring and painful. If we get a reward from working hard, our chances of running longer and faster are increased. And, with them, our chances of survival. As Christopher McDougall pointed out in Born to Run, his inspiring book about long-distance running, running is in our DNA, in how our bodies evolved to have an Achilles tendon and sweat glands and a series of other adaptations that make us all into potential marathoners." That's right, your body has actually evolved into an efficient running machine. And not only does running mimic the high you get from your favorite strain, it's healthy for you. Talk about a win-win! Apparently when love is in the air, it can make you feel pretty friggin' high. Scientists recently found that higher levels of oxytocin can release anandamide, an endocannabinoid that plays a role in the neural generation of motivation and pleasure, among other behaviors. Oxytocin is a hormone that plays a crucial role in social bonding, sexual attraction and reproduction, childbirth, and mother-baby bonding. These feelings of "love" ratchet up your oxytocin levels, which in turn dial up your body's anandamide effects. Anandamide is internally similar to THC in that THC can attach to cannabinoid receptors on neurons in the brain and activate them in a manner similar to anandamide. Thus, scoring a hug from that cutie you've been crushing on will produce similar chemical effects to a nice euphoria-inducing OG Kush. 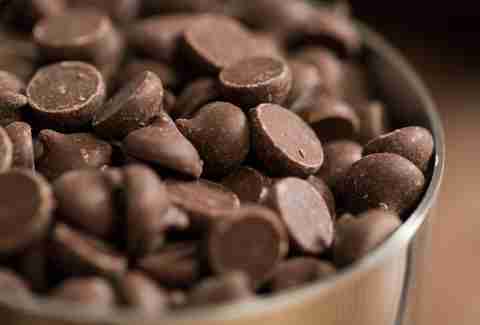 In 1996, researchers discovered that chocolate contains anandamide, as well as two substances that could mimic anandamide's effects, N-oleoylethanolamine and N-linoleoylethanolamine (yes, those are both actual words). That's right, chocolate, the delectable treat that's allowed people to eat their feelings since 1900 BC. According to researcher Daniele Piomelli of the Neurosciences Institute in San Diego, the old wives' tale that chocolate is an aphrodisiac may have stemmed from the blissful effects it can deliver thanks to anandamide. However, don't rampage through the Hershey's factory like Augustus Gloop and expect to feel as blitzed as you would from an evening of Bruce Banner consumption. Said Piomelli, "We are talking about something much, much, much, much milder than a high." 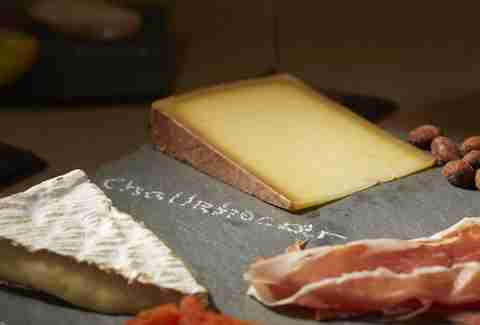 If you're more of a fromagerie fan than a chocolate addict, I have good news for you (or bad, depending on the severity of your affinity). 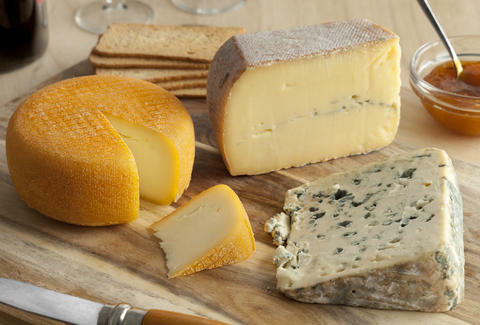 Researchers from the University of Michigan have found that cheese contains a chemical that's also present in drugs. Well, actually a lot of processed food is associated with addictive-like eating behavior, but cheese in particular contains casein, a protein commonly found in mammal milk. Casein provides your body with amino acids, carbohydrates, calcium, and phosphorus, and it can also trigger your brain's opioid receptors and deliver feelings of euphoria similar to those delivered by cannabis. Although casein in milk provides only a tiny dose of the drug-like effects, to make a pound of cheese you need about 10lbs of milk. The casein separates from liquids and coagulates solid milk fats, resulting in a higher concentration of it in cheese and the potential for addictive eating. So the next time you exclaim, "Man, I can't get enough of this cheese! ", you could actually be talking about both the hybrid strain Cheese and the delicious cheese and charcuterie spread in front of you, but either way, you're probably experiencing similar feelings of happiness and euphoria. Catnip, or Nepeta cataria from the genus Nepeta, is a species of plant that's commonly used in cooking and brewing herbal teas. Oh, and about 66% of cats go crazy for it. An essential oil called nepetalactone that's found in the stems and leaves of the Nepeta plant can have powerful effects on kitties (and not just domesticated cats, but other species such as tigers, panthers, and leopards). 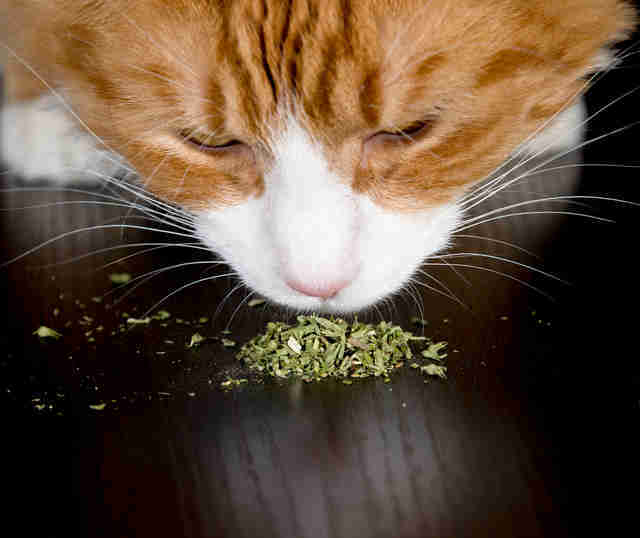 Sniffing the plant is thought to stimulate the receptors in a cat's brain that respond to "happy" or pleasurable pheromones, while eating it can bring about mellow effects. "Killing pests can be counterproductive, because they breed or select for resistance very quickly. This happens with a lot of poisonous types of plants, as it does with pesticides. But if the plant merely confuses the pests or disables their memory, it can defend itself against them overindulging. Pure speculation, as I say in the book. It occurred to me that it might help explain what's happening with cannabis, which of course also disables memory." This article was originally published as "5 Things That Are Chemically Similar to a Cannabis High." For this and more articles on cannabis news and culture, visit Leafly News.